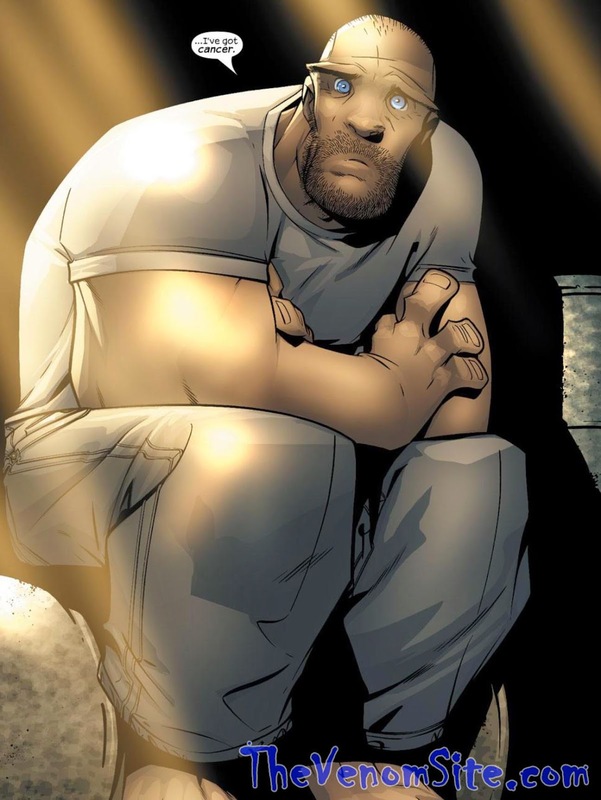 Welcome again to the conclusion of "Psych Ward Unabridged: Eddie Brock"! In the previous article, I explored Eddie's psychological roots developed from childhood into adulthood and the dynamics which were introduced when he became Venom. Let's continue, shall we? Eddie's emotional separation from the Venom symbiote began long before their physical separation. In the final pages of Venom: Separation Anxiety #4, Eddie's battle with the Life Foundation symbiote spawns uncovered the truth about the extent to which the human host has control in the symbiotic relationship, which caused him to contemplate his own symbiosis. Years later, his revelation would find its light when the symbiote sought a new host when Eddie's cancer returned (Spectacular Spider-Man Series 2, Volume 1: "The Hunger"). Though the symbiote failed to find a new host and remained with Eddie by Spider-Man's intervention, Eddie's relationship with it had reached its conclusion and, shortly after the incident, he auctioned off the symbiote to a mob boss and the father of the second Venom host, Angelo Fortunato, for charity (Marvel Knights Spider-Man Volume 2: "Venomous"). At this point in life, Eddie abandoned his previous quest for love and admiration, and held onto his general selflessness by donating the total sum from the auction to charity only. Unable to face a life in which he would be reminded every day of his sins as Venom, Eddie attempted suicide once more, only to fail. He was then hospitalized and treated for his cancer. 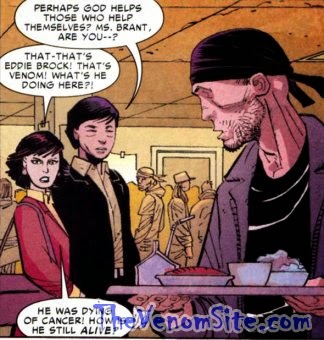 When May Parker was admitted to the same hospital after having taken a sniper bullet in the wake of Peter revealing his secret identity, Eddie's insanity from his career as Venom relapsed. Whether this was caused by trace symbiote tissue that remained in his system influencing his psychology or not is still unknown, though Eddie claims that it was, indeed, the symbiote that influenced him to attempt to murder the helpless woman. Eddie's conviction of protecting innocents like May proved stronger than the sinister influence, and he instead attempted to purge himself of the remaining symbiote traces before again attempting suicide. He survived thanks to Peter's intervention, and the event signified the final days of his instability from his career as Venom. From then on, Eddie sought to try to atone for his sins through charity at the local F.E.A.S.T. (Food, Emergency Aid, Shelter, and Training) kitchen as he continued his cancer therapy. His work proved beneficial to his psyche as he slowly began to realize all of the wrongs he committed, especially in blaming Spider-Man for his exposure to the alien symbiote, which he now demonizes along with its kin. Eddie relapsed only once in his violent tendencies when he mauled a homeless oppressor in a feverous rage; otherwise, Eddie proved himself a valuable member of society even to May, whom he worked alongside at the kitchen. Another positive influence that helped Eddie cope with his cancer and sins was his faith. Though he had a Roman Catholic upbringing as a child, Eddie had never had strong religious inclinations. After ridding himself of the Venom symbiote and surviving two suicide attempts, Eddie may have returned to his faith when he related the symbiotes to demons instead of extraterrestrial beings. Whatever the cause, Eddie's faith was the vehicle that helped him find salvation through charity and atoning for his sins. When Eddie became Anti-Venom during Venom's (then hosted by MacDonald Gargan) attack on the kitchen, his violent psychology tied to his Venom persona transformed into that of an antibody attacking a disease, reflecting the nature of the Anti-Venom faux symbiote. His faith also took on a more extreme role, and together with his hatred for symbiotes and new lease on life as a servant to the people, Eddie took on the role of an anti-hero towards any symbiotes, criminals, and any other negative outside influences he deemed to be cancers or diseases. Though Spider-Man still withheld some distrust in Eddie for his past crimes against him and his own, the fact that he eventually saw Eddie as possibly being a better person as Anti-Venom, in turn, helped Eddie to accept Spider-Man as a friend rather than a foe. Eddie still faced the temptation for extreme violence despite his second chance, and often struggled to keep himself in check as Anti-Venom. The temptation was even stronger than before, too, since the power of his Anti-Venom faux symbiote was significantly greater than that of any symbiote's; the faux symbiote exhibited new abilities and no viable weaknesses outside of constituent matter exhaustion through over-expulsion, Mister Negative's special powers (by which the faux symbiote was mutated), and a toxin Norman Osborn developed using Freak's DNA. The solution to Eddie's self-control issue presented itself early on in his new vigilante career in the form of Jenna Cole, a teenage drug addict whom he saved and purified. She became a physical manifestation of his conscience when he allowed her to work with him as his partner in cleaning the streets of crime and illegal drugs. Whenever she was near him, Eddie would display his best behavior and remind himself to never fall back into his old ways in the hopes of becoming a better man and a hero. Likewise, Eddie served as Jenna's guardian angel and her constant reminder to never fall under the influence again. When both were separated, their demons returned; when they reunited, their resolve to do better was established once more. Unfortunately for Eddie, this relationship did not last long—perhaps due to the dangers he exposed Jenna to, he convinced her to lead a new life without him. Eddie soon received affirmation for his new lease on life, which provided him with a simultaneously positive and negative psychological influence. In his war against Mr. Negative, he was finally able to earn some respect from Spider-Man when Eddie revealed the villain's secret. He took this feedback from a former antagonist as an affirmation of his good work, which both improved his work as a hero and fueled his psychosis. Along with his psychosis, Eddie's spiritualism began to blossom as he connected his work of purifying the world with biblical context. Combined with his seeming invulnerability with the Anti-Venom faux symbiote, he began to develop a messiah complex, which only intensified with the events of Spider-Island. Eddie was one of the only individuals armed with a potential cure to the transformative virus that struck Manhattan's human and superhuman population, which put him in a position of ultimate power. That power was challenged by Agent Venom (Flash Thompson) when the symbiotic super soldier's symbiote attempted—and successfully, albeit briefly—re-bonded with Eddie when he was at his weakest. That moment was most likely a sobering one for Eddie, as he was reminded of his own mortality and the fleeting nature of the Anti-Venom faux symbiote's power. This also may have made his decision to give up that power to save Manhattan somewhat easier along with his diminishing messiah complex. Above all, though, he made the decision based on his core quality of selfless charity. The decision and its results earned him temporary fame as he was named the hero of Spider-Island, thus validating his efforts and fulfilling his basest desires for recognition. When Eddie sacrificed his Anti-Venom faux symbiote, he sacrificed every last trace of anything in his system that could potentially give him the power to continue his vigilantism. However, his vindication towards his mission of ridding the world of symbiotes never diminished. Forgotten by the masses for his sacrifice soon after, Eddie used his remaining personal funds to arm himself for his crusade and proceeded to hunt down and neutralize both Hybrid (Scott Washington) and Scream (Donna Diego). The vendetta itself drove Eddie mad with vengeance and piety as his psychology fed on the remnants of his messiah complex. When he was forced to bond with the Toxin symbiote when the Crime-Master captured him, Eddie's hatred for the symbiotes surprisingly took a strange turn: instead of completely rejecting the spawn, Eddie struck a deal with it. His and the Toxin symbiote's hatred for Venom was intense enough that they allied themselves temporarily to eliminate the common threat. The alliance eventually rekindled Eddie's Lethal Protector mentality as well through the remnants of his former messiah complex, causing him to psychologically regress and undoing his therapeutic efforts. 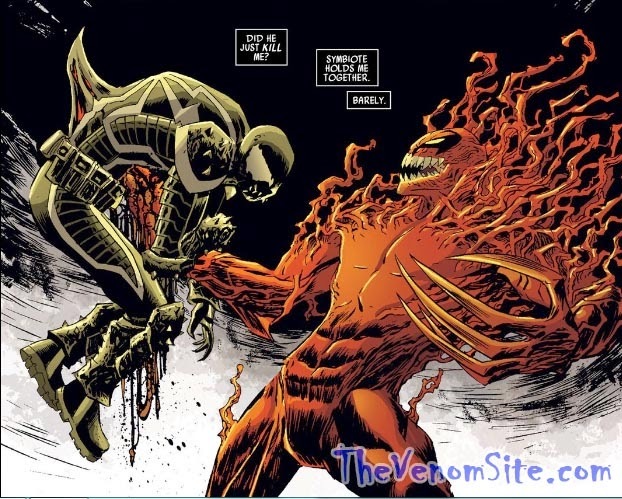 Unlike his previous relationship with the Venom symbiote, Eddie shares no love with the Toxin symbiote, and both vowed to attempt to kill each other once they've rid the world of Venom and its other spawn. After he helped Agent Venom to defend West Philadelphia High School from a pack of Symbiote Slayers, Eddie again came to the same realization he had years before with Spider-Man (Amazing Spider-Man #375) about Flash's good work as Agent Venom and allowed him to continue as a hero until the day came when Flash lost complete control of the symbiote. It is unclear if the second revelation has any impact on his own psyche, but for now Eddie remains unchanged in his Lethal Protector psychology and his hatred for all symbiotes. Given over 25 years of history and material, an interesting overarching theme to Eddie's character seems to develop. Much in the way that Eddie's victimhood and lack of responsibility when given great power are his core characteristics, so, too, is the nature of symbiosis. According to the Merriam-Webster Dictionary, symbiosis is defined as "the relationship between two different kinds of living things that live together and depend on each other." This is mostly true for the alien symbiote race, as I had explained in a previous article; however, this definition also applies to Eddie as a character. As I had mentioned earlier, had Eddie never bonded with the Venom symbiote in the first place, he would have killed himself or lived on and become consumed by cancer. With the symbiote's intervention, he survived. Now, this is a very on-the-surface analysis of Eddie's symbiotic characteristic, but there is another level to it: up until his initial bond, Eddie was unable to survive alone in a harsh world that rejected him. His victim complex signified this inability, and it wasn't until he was bonded with the symbiote that he was given the strength to survive, both physically and emotionally. What I'm proposing is that Eddie is a human symbiote—not in the sense that he was born a mutant, but that his circumstances turned him into one psychologically. He requires emotional partnership in which he can receive the support he needs to fight his victim complex and provide, in turn, physical support. This trait is apparent in all three of his vigilante personas. As Venom, the symbiote provided him an exclusive partnership in which it sympathized with his victimhood and frustrations while he provided the symbiote with a viable host. 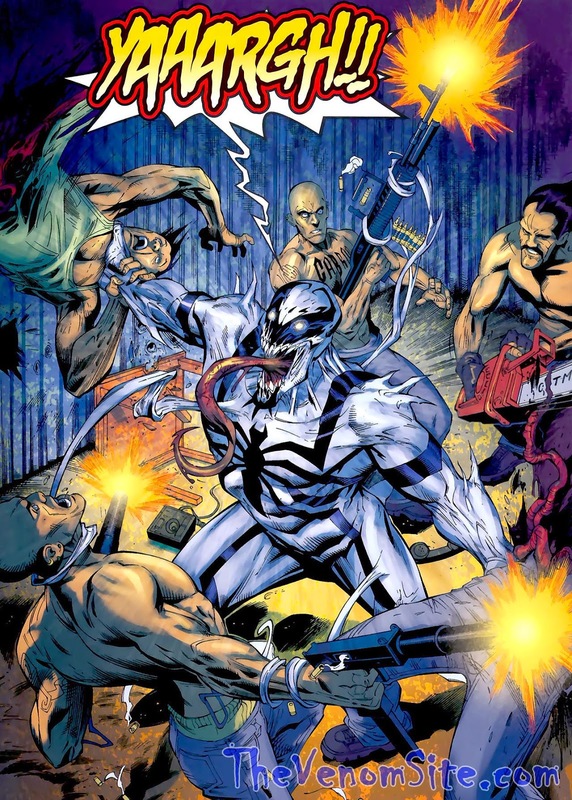 As Anti-Venom, his the symbiotic dynamic shifts from between Eddie and his non-sentient faux symbiote to between Eddie and Jenna; Jenna provided him a physical embodiment of his conscience and a reminder of his desire to become the hero he wants to be while Eddie provides her with a similar service and protection as Anti-Venom. Finally, as Toxin, the dynamic shifts back to between Eddie and the symbiote, but is also altered: instead of providing Eddie any emotional or psychological support, the symbiote provides him the power necessary to combat other symbiotes while Eddie provides it with a temporary host. 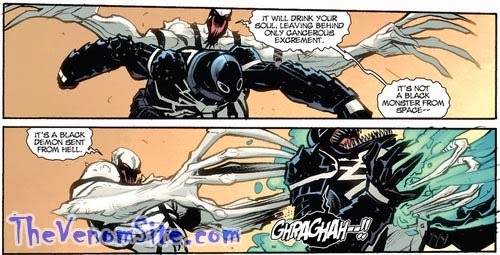 Any way one chooses to view this point, it becomes apparent that Eddie is indeed a type of symbiote himself. Whenever he lacked a bond to a symbiote or someone to provide him the emotional or psychological balance he required, his antics were self-destructive, to sum the point up. Even when he was bereft of his Anti-Venom faux symbiote and before he bonded with the Toxin symbiote, Eddie quickly became psychologically imbalanced—he was manic, ruthless, and a danger to himself and others. He may have had the knowledge and tools to take on his enemy—the symbiotes—but he could have easily been killed when he was captured by the Crime-Master. Add to that example all of the other times Eddie was without support, and it becomes apparent that he would have eventually died in every instance. Therefore, Eddie requires emotional and psychological support from an outside source to appease his victim complex and help him function just enough to survive. So ends my analysis of Eddie's psychology. I hope you found this article series interesting, if not educational. I promise to update it in the future whenever his psychology takes on a new aspect. If you have any questions, comments, or suggestions for improving "Psych Ward Unabridged," please direct them to the comments section below. Don't forget to check back here on A Dose of Venom for new content, and make sure to visit The Venom Site for all of your symbiote news, reviews, and point-of-views!